I don’t get a chance to blog as much these days, between mothering a toddler and coaching my clients. I find that I miss it, though. So today, as my son naps, I find myself with a precious hour or two. Time is a hot commodity as a parent. Whether working out of the home, full time, part time, or stay at home (what a misnomer! ), all moms and dads find that there’s a new “normal.” Yes, we can still carve out time for ourselves, but it’s no easy feat. It takes compromises, trade-offs, and in many cases, communication with a partner. Point being, when even a shower is not to be taken for granted, there can be a lot of pressure when I find myself with an hour in the middle of the day to spend as I see fit. I review my options. I could clean the bathroom (we haven’t hired a house cleaning service, something that I would nonetheless advise ANY new parent to squeeze into a budget). I could read any of three books that I had optimistically purchased on Amazon. I could answer overdue emails and texts. We do what we are to feed ourselves. To remember who we are. I am a writer who loves psychology and personal growth. These fields are interwoven for me, personally and professionally. As an INFJ, I tend to look at the world in terms of where I want to grow. It’s my idea of fun to jot down goals in each area of my life where I want to focus in the coming week. I love understanding mental processes, perceptions, and motivations. This is why I’m a coach. It’s also a part of parenting that I really love, as well. So in the context of my new “normal,” I’m okay with a certain degree of clutter in our home. I’m okay if my exercise is running around the playground and park (believe me, I have the biceps and quads to prove it). I’m okay if couple time is family time. There’s a season for everything, and other seasons will circle back around again. For now, it’s a season of growth: my growth, my son’s growth, and my clients’ growth. My son went through three shoe sizes in three months. I’m ready for new shoes, too. At Forest School this morning in South Mountain. Lessons in resilience. My 19-month-old son rolled down some (carpeted) steps on our way out, then another toddler accidentally threw a rock at his forehead by the brook. While justifiably upset, he recovered quickly (after a few tears) from both and adventurously waded knee-deep in the brook, finding the biggest rocks he could possibly pick up and throw. The lesson for me is to be prudent and don’t take needless risks, but to keep on trucking. Expect comfort, and offer it. Be brave. For me, bravery doesn’t mean not expressing feelings. It means not being held back by accidents. Not losing out on opportunities for joy. Wading in the cold water, he pronounced “BIG!” as he hoisted each rock up to his shoulder. Last Saturday, my husband and I found an oasis that was new to us. We drove to the NJ Audubon Society for a hike through the woods along the Passaic River, listening to birdsong. We spotted a few birds (swallows being the only ones I could confidently identify). Their music was as resonant as the sighting of them was elusive. Sometimes I did spot one fluttering, diving or weaving through the treetops, but only a glimpse. A couple of years ago, we spent a long weekend in Cape May during peak fall migratory season. Two Audubon guides pointed out egrets, kestrels, and merlins. They trained us to call out the birds’ location by the hour of the clock, to first look with just our eyes, then to lift our binoculars. Our leaders may not have been impressed with our bird identification (or lack thereof) if they’d joined our hike on Saturday, but they would have been pleased at how happy we were simply being there, appreciating nature. It was such a pretty spot: bushes with little white flowers, a plant that looked almost like honeysuckle, so many chipmunks, an occasional bumblebee, and tall, majestic trees that seemed to emanate wisdom. On Sunday, we created an oasis in our backyard. We have had grapevines growing over a pergola, but they rested on low beams. By raising them onto higher stilts, we created a space under which you can walk or sit, as I’m doing now, while sparrows eagerly hop around exploring the grass. Why do we need nature to fill us up and restore our wholeness? Perhaps some of us feel its need more acutely than others, but I would argue that it’s a basic human need. Even if urbanites fill it by a walk through the park on their way home from work, or by having houseplants or an aquarium, none of us can live happily without nature’s balm. People and nature are deeply interconnected. We rely on it for physical, as well as spiritual, sustenance. Physically, people feel healthier when they eat more whole foods and fewer processed foods. We live in a natural world, no matter how many steel towers are built to live and work inside. Spiritually and emotionally, there is something soothing about listening to birds singing, hearing the flapping of wings and watching their trajectory in flight. It is energizing to walk through the woods, curious about where the path will lead, deciding which twists and turns to explore. It is meditative to sit by a river, studying the water as it rushes over rocks. Nature has both stillness and movement. It exists in the present, yet is always growing and changing. No tree or river is the same today as it was yesterday, yet they retain their essence. What an inspiring model for me, as I consider who I am becoming. I am a writer, coach, musician, wife, nature lover, and play many other important roles, too. How can I move ever closer to who I am? Who are you becoming? What will help take you there? I would love to hear from you. All of these experiences involved adventure and challenge. Some entailed physical anguish: aching at mile 10 of a half-marathon or portaging on a canoe trip. Other times, the anguish was mental: realizing I had a ways to go at speaking French fluently or being a virtuoso at the organ. I’ve played the piano since I was seven, but only started learning the organ a couple of years ago. It’s easy to think people will notice every mistake, but the truth is, no one’s standards for my playing are as high as my own. Before playing, I often think, “It won’t be perfect, but it will be beautiful.” This mindset helps me to stay present. Playing is worth the nervousness–it’s creative, rewarding and fun. It’s also gratifying to see my progress, no matter how slow. It gives me a sense of achievement, and hopefully has a positive impact on others. How can we light the path to our achievements? Visions can be powerful tools. I use visions in many areas of my life: work, family, health. My “music vision” continues to evolve, but core components are a pipe organ, choir loft, beautiful sanctuary with stained glass, singing a foreign language, decently paid, and pastoral support. One church where I played last summer checked nearly all of these boxes. It was gorgeous, like a jewel box or music box–a music box decked with jewels, perhaps. I played on a 3-manual pipe organ and sang Italian hymns. It had a choir loft, so I didn’t feel conspicuous. It didn’t check one or two boxes, but otherwise, it was a music dream come true. I knew less about the pipe organ when I began playing at that church than I do today. When I sent in my resume, it was because I believed that I knew enough to get started, to pick up what I didn’t know, and to do a good job. I had enough passion that I took the right steps to get hired, and filled in the gaps later. I studied registration more closely–principals, flutes and reeds; 8, 16, and 4 foot stops. I learned about couplers. At first, I relied primarily on pistons (pre-sets), but after a few weeks, I was doing my own registration (or selection of stops). My vision got me to that point of playing the organ and singing Italian in a jewel-box of a church. I can look back at various mistakes I’ve made–playing at the wrong time, missing a note or two, ending a hymn too soon–and congratulate myself. Why? In most lines of work, someone who is successful fails more than someone who isn’t successful; she just recovers more quickly from her failures. Who remembers a missed note–or even notices? If I always played it safe, I wouldn’t leave my house. Some of my “peak experiences,” or vivid memories that reveal my core values, involved stepping way out of my comfort zone, being scared silly, and taking action anyway. Speaking of leaving my house, the first month I lived in Paris, I barely ventured outside my new neighborhood as I acclimated to new surroundings and a new language. Yet by the end of the year, I felt at home in the City of Lights. My comfort zone had widened. I had learned to navigate the subway, shop for groceries and order lunch at a cafe–all in French. I certainly hadn’t felt comfortable doing those things when I arrived. Passion conquers fear, but not without courage and persistence. We need to be willing to fail, and keep moving forward anyway, to make our dreams a reality. So keep failing, keep succeeding, and you’ll move ever closer to your wildest dreams. What is something that you’ve achieved in spite of adversity, because your passion was greater than your fear? What challenges have you taken on because deep down, you knew that you had it in you? Most importantly, how can you apply that learning to what you want next in your life? I have always been an amateur psychology buff. In college, I had a class in perceptual psychology, but mostly I have dabbled in it on my own. It is part of what led me to coaching. I am endlessly curious about how our minds work, how we see the world and interpret what we see–what information we gather, and what meaning we assign to that information. Over the years I have taken a few personality surveys. I have also encouraged my loved ones to take them, with varying responses. They aren’t for everyone, and that’s OK. Personally, I find it fascinating to reflect on what drives and motivates us, what makes us flourish. I find Myers-Briggs (MBTI) to be revealing and mostly on-point. Like any paradigm, it has its limitations, but most of its insights resonate with me. I took the MBTI twice, several years apart. Interestingly, while my overall type hadn’t changed, my Intuition (I) and Judgment (J) factors had both mellowed considerably–allowing more room for their counterparts, Sensing (S) and Perceiving (P). I believe we have innate preferences, but through our experiences and choices in how to see and engage with the world, we change. Another survey I like is the VIA Character Strengths Survey, which measures 25 character strengths and lists them in relative proportion. My top strength was “Appreciation of Beauty & Excellence,” followed by “Gratitude,” “Love,” and “Perspective.” For me, this test is revelatory because it points to what I need to flourish–where I thrive and what saves me, as it were. My top strengths remind me that to be happy, and fully myself, I need to seek opportunities to enjoy beauty, to love and be loved, and to practice gratitude. On a lunch break, I find refuge in a park around the corner with a waterfall and yellow hyacinths in bloom. It truly restores me. I make time to play the piano, organ, and sing. Even on a busy weeknight, if fills me up and I leave feeling like myself again. I listen to and watch others who are more talented than I am. It inspires me and makes me feel alive. My first reaction to reading that was, “Are you kidding?” Identifying confrontations is about the last thing I want to do. My mind isn’t naturally wired for it. Nonetheless, our minds are pliable–we can actually forge new neural pathways by changing our thoughts and habits. And thus, we change and grow. Coaching asks for openness to seeing ourselves as we are today, seeing ourselves at our most magnificent core, and dedicating ourselves to moving bravely toward our truest self. It can be a little scary. 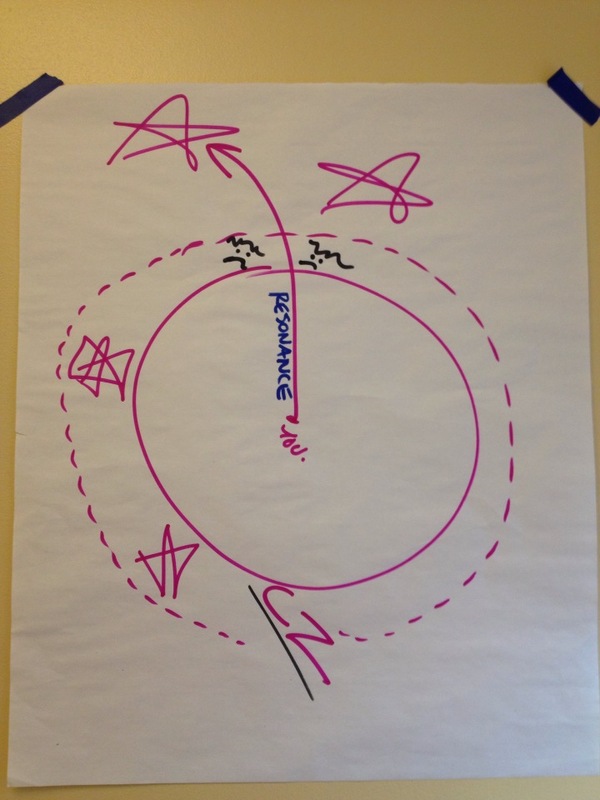 At my Fulfillment class at CTI, one of the leaders drew this picture of our comfort zone, with stars outside of it, illustrating that to reach for the stars, we have to step outside our comfort zone. So, if we’re uncomfortable, we’re doing something right. Yet we don’t have to be constantly uncomfortable. We’re allowed to take a step or two forward and stay there–or dance up and down the steps we’re familiar with–till we’ve gathered the resolve to take another step. We get to be at choice. What does it mean and what is its impact? I can honestly say that I don’t completely know, but that it centers and directs my life journey. There is something compelling about the beauty of nature, art, music and writing that inhabits me–even simply the appreciation thereof. What does it mean to hold beauty? I hold it in my eye, ear, mind, and heart. How will it impact others? That story is still unfolding. What are your top strengths and values, that when engaging in them, you feel the most like yourself? Who are you at your deepest, most magnificent core? I’d love to offer a sample phone call to explore your values and what you most want. What matters? What are you drawn to? Call or email me to set up a session to move toward the stars. This weekend I was sick with a cold. My cubicle neighbors at work have been hacking up a lung and the germs must have circulated. Whenever I feel a cold coming on, I take zinc lozenges, which usually make the cold half as bad as it would have been otherwise. I can’t stand the idea of being knocked out for 5-7 days, given all that I do in the course of a week, and I also just don’t like feeling rotten. Taking zinc, along with drinking water and getting extra sleep, allows me to feel semi-decent and not cancel too many activities. I remember the last time I felt a cold coming on, I had run out of zinc lozenges. I considered stopping by a drugstore for more, but decided not to. Maybe it was laziness or lethargy, or maybe it was the fact that I’d been going at full speed for weeks (months?) and simply wanted a break. I wanted to crawl into bed at 8 PM and sleep till 8 AM. I wanted my job to be blowing my nose and drinking tea. Why can’t I give myself permission to take a break when I’m not sick? It seems there’s always something to do. I need to print tax forms, dust and sweep the house, get groceries and do food prep, choose music to play for Easter. The list can feel practically endless at times. I can take steps to reduce my stress and the length of my to-do list. For example, I’ve been meaning to hire a cleaning service to help me once a month or so. I can ask for help, I can leave some things undone, and do other things in a cursory fashion. When our out-of-town family stopped over for tea and dessert, I was a little embarrassed that the house wasn’t without a speck of dust (I regret to say the bed may have been unmade). But the dishes were done, there were comfortable places to sit, free of clutter– and besides, they came to visit, not to inspect every corner. Do I want to enjoy a full life, or do I want to become a crazy person who stays up till 2 in the morning, cleaning? There are ways to let life be more manageable. There is room for more ease, more routines that will help me with my goals. In the meantime, I can give myself a break. I work in publishing in the city, am a professional coach, landlord, musician, and wife. I volunteer with Big Brothers Big Sisters, which I love, but it too takes time. I also try to make it to my yoga mat or the treadmill a few times a week. I enjoy stretching myself and doing things that make me feel truly alive–more connected to others, and to who I am at my core. Sometimes I do enjoy plopping down on the couch to watch a movie, and I need that to recharge–but I’m glad that a sitcom binge is a relatively rare occurrence. I can practice being mindful about how I inhabit my own life–how I structure, stretch, and play with it. When I’m sick and want to absolve myself of any responsibilities beyond sleep, it’s a sign that I’m craving more balance. Perhaps I’m craving time to prop up my feet and look out the window–just look, and let my thoughts come and go like clouds. I might need time to write in my journal, to reflect or meditate. Life is lived both internally and externally. Both are important and they complement one another. The time I spend reflecting or journaling powers me up to engage more willingly and productively in the world. Once I’ve been active, I have much more enjoyment in a quiet night (or weekend) at home. #1 Wellness: this means sleeping 8 hours, doing yoga, and running. Trying to eat real food for lunch, and enough food that I don’t raid the candy drawer at 3:00. #2 Fun, love, and friends: for me, this means spending time with those I love–especially my husband, friends and family–and doing things simply because I enjoy them. #3 Mastering the organ pedals: if not now, when? I have an excellent teacher, and my year will only get busier as it goes on. So I’ve committed to practicing 4 or more times a week. #4 Expanding my coaching business: I’m taking more workshops at CTI and going to events through Meetup.org to connect with people who may be curious about coaching. If I’m craving down-time, the non-essentials have to go. As a result, there are other activities I’ve turned down because they don’t fit with my vision of my future self. At this point in my life, while I might derive certain benefits from them, they ultimately get in the way of my top priorities. If they divert from where I want to put my focus, they don’t serve me–even if I would enjoy them. So right now, I can forgive myself when the house is a little messy. I can feel good about leaving things undone and getting a good night’s sleep. I can be proud when I devote time and energy to my coaching and music businesses. Having a vision reminds me of who I want to become, and what trade-offs I’ve decided I’m willing to make in order to get there. Let the rest fall by the wayside… there will be another phase of life when I could pick some of it back up. Are you ready to explore your life vision? Who do you want to become? What’s something that if you never did, you wouldn’t feel fulfilled? Visit my coaching page for ways to connect with me. You may find that setting up a free sample call with me could be an important step towards creating an even richer and more fulfilling life. On Sunday, I sang at our local church where I volunteer as a soprano. I love singing there because of the beautiful and often challenging music. The five of us in the choir loft that morning sang “Forty Days and Forty Nights” and three other English-language Lenten hymns in four-part harmony. During Communion, we sang chant with psalm verses in Latin. By the end of Mass, I felt filled with breath, music, and gratitude. We stopped in the parish hall for a light breakfast, where a few older women in the parish chastised us: “good voices, but the Latin’s got to go.” Was this what I’d signed up for? Their remarks stung and I felt unappreciated for what I had offered, until I remembered that a gift benefits the giver, no matter the reaction of the recipient. Then I was freed of an expectation of a wholly positive response. Sometimes as a musician, whether it’s singing or playing the organ, I long for appreciation. In a musical performance, I am offering a gift to the listeners, and hope it will be well received. However, its value is determined by creativity and self-expression, rather than the reaction of the listeners. I sing primarily for two reasons, which are intimately linked: self-expression, and the joy of giving. The pleasure a recipient takes in a gift has value, but it doesn’t determine the value of a gift. On Sunday night, I was playing Scrabble with my husband’s cousins, who were in town for a few days. It was a close game. My first play was “ZAG” with a triple-letter score on the “Z,” for 35 points. I had an early lead, but none of my subsequent plays lived up to the glory of the first. As we neared the end, all four of us had around 100 points, give or take. We all had strange combinations of letters in our remaining titles. I had three E’s and two O’s. My cousin-in-law had a J but nowhere to play it, as I discovered later. He was considering skipping his turn because he felt that anything he could play would be too low-scoring. I suggested that scoring any amount of points would be a good thing. I don’t know what my current or next project will teach me. If I think I know, it’s my ego talking. If I think I know what the results will be, it’s really my ego talking. I don’t have to let fear of not being perfect–or not being appreciated by everyone at all times–stand in the way of doing a good-enough job. I finished the Scrabble game with all three E’s still on my rack. My cousin-in-law finished with his “J” unplayed. And it was OK. It was good. I’m honored to have been nominated for the Liebster Award by Upasna Mattoo at LIVE OUT LOUD! Thank you — I always enjoy reading your blog, and am looking forward to connecting more. 1. What’s the best adventure you’ve ever had? Traveling through Sicily must have been one of the very best adventures I’ve had. My husband and I took a ferry from Rome to Palermo then took trains around the island. We saw Mt. Etna from Taormina, ancient Greek temples in Agrigento, and wandered through food markets in Catania. 2. Where do you see yourself in ten years? Doing lots of writing, working one on one with coaching clients, playing the piano and organ, hiking, and traveling. 3. If you were an animal, what would you be? Definitely a cat. They are experts at being present and perceptive. They engage in lots of sleep, cuddling, playing, exploring their environment, and deep observation. 4. What’s the one food you can’t live without? Dark chocolate. In Modena, Sicily, I went to a chocolate shop with hundreds of kinds of exotic chocolates including 99% chocolate. 5. What is your life motto? Be present. 6. What is the strangest thing you’ve ever eaten? I’m not sure what this would be. Probably calamari. 7. If you could go back and visit any time period, what time would you travel to and why? It would be hard to beat meeting Jesus. Meeting Sappho, Shakespeare, or Lincoln would also have been amazing experiences. 8. Name a gift you will never forget. My husband is the most thoughtful gift-giver. He once gave me a yoga membership to Om Yoga in New York. Another year he gave me a weekend NY Times subscription because it made for a leisurely Sunday afternoon. For our fifth anniversary, he gave me two books of organ music–German/Austrian and Portuguese/Spanish. 9. What is your biggest addiction? Caffeine. I’m working on breaking my adrenaline addiction and being content with a half-cup of coffee rather than two cups. Peacefulness is so much more relaxing. 10. Where do you see yourself in ten years? See #2. I will add to my answer: being of service–in my career, through volunteer work, and to my family. There is nothing like the weekend. It’s been said before. 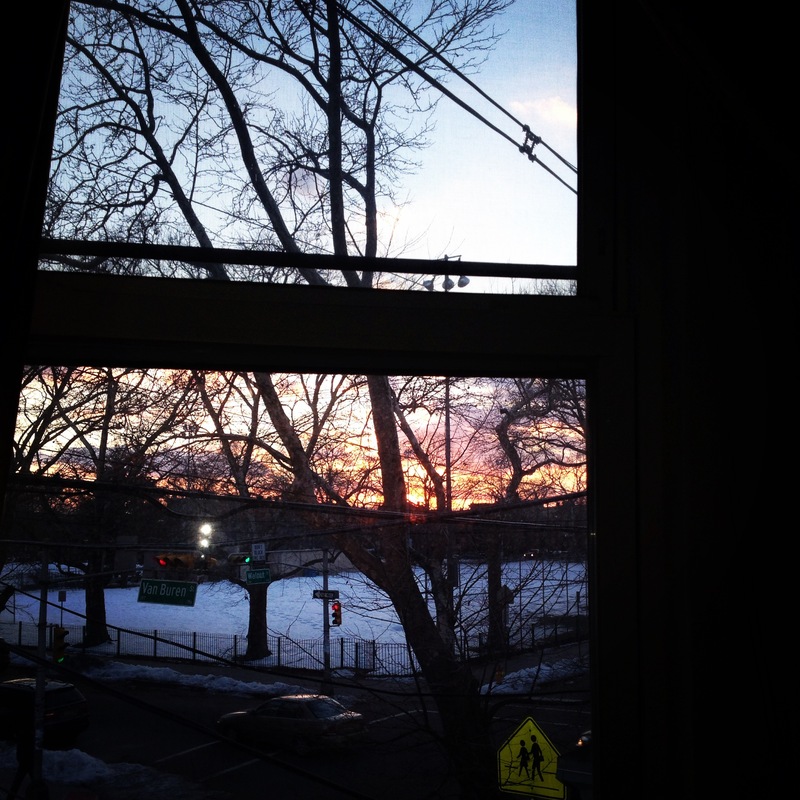 Still, there are times when I wake up from a nap, make myself a cup of tea with soymilk, and sip it on the living room couch, looking out the window onto snowy Independence Park, and am struck with so much pleasure and gratitude that I’m nearly incredulous. I’ve lived in the house that I share with my husband, our cat, three sets of tenants (and their dog and two cats) for a little over two years. We spent the first three years of our marriage in a 3-bedroom apartment in Williamsburg, Brooklyn, where we rented out the other two rooms. It was supposed to be temporary, but we hadn’t planned on it being 3 years. That’s a long time for a married couple to share a kitchen and bathroom with roommates! 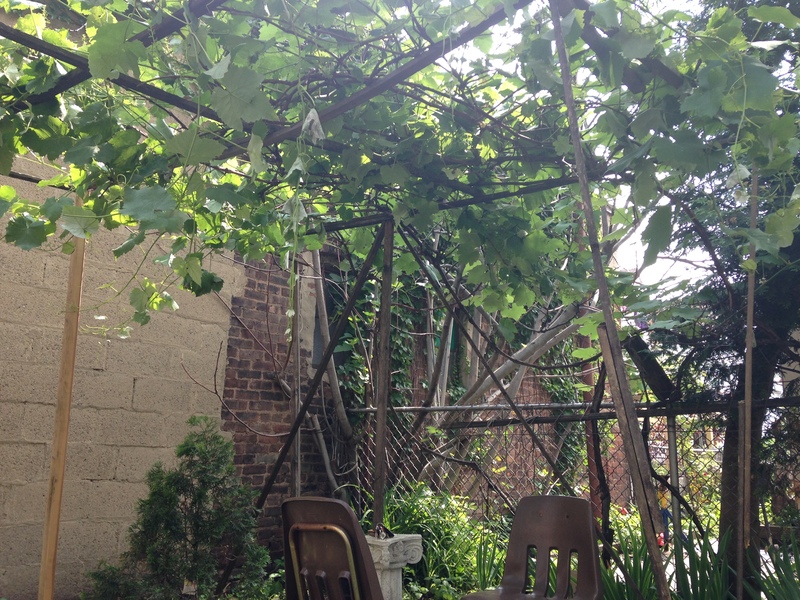 Granted, the location was amazing, with Manhattan just two stops away on the L train, cafes aplenty outside our doorstep, and a backyard with a cherry tree, fig tree, and grapevines…yes, trees grow in Brooklyn. Once, a NY Times reporter contacted me for a story on the number of responses Williamsburgers get to Craigslist ads for subletters, and it’s true, there was no shortage of interested parties. Regardless, a certain strain was inherent in our living situation, so moving to our own house has been a little piece of heaven. I’m still getting used to having a guest room, living room, and dining room. I don’t have to guess if it’s our food in the fridge or someone else’s. My husband doesn’t even seem to mind taking out the trash, a job that we (thankfully) assigned along traditional gender lines. Maybe he enjoys the feeling of proprietorship. (It’s *our* trash, well ours and the tenants’, ha ha). In any case, I get it–when I mop the kitchen, something I could probably stand to do more often, I have the feeling that this is *our* floor. It’s a feeling I never had as a renter. I should take this opportunity to clear the air and share that we live in Newark, and it’s a lot nicer than you think. 🙂 (Don’t tell too many people, though, or you’ll drive up the cost of living.) We live in the Ironbound, a mostly Portuguese and Brazilian neighborhood 22 minutes on the PATH train from World Trade (hence the title of this blog). Purchasing a multi-family house with three bedrooms for ourselves wouldn’t have been possible in the urban core of Brooklyn. We just have to put up with the occasional response, “you live in Newark? You just hear Newark and you think…” (then they make a face, trailing off). People’s memories of the ’67 riots die hard. Yet I feel like I’m in Europe or South America. My hairdresser kisses me on the cheek. I can get a “galao” (Portuguese for latte) for under two bucks, and an excellent fish dinner at any number of restaurants. There are tons of cultural amenities. We live near NJ PAC, where we’ve heard the NJ Symphony Orchestra, and brought my family to readings at the Geraldine Dodge Poetry Festival. My brother-in-law gave us a patron’s membership to the Newark Museum one Christmas, whose Asian, American, African, and Classical art collections we’ve enjoyed, as well as the Ballantine House. There’s excellent hiking 25 minutes away–not to mention Branch Brook Park in Newark proper, with the largest collection of cherry blossoms in the country. I’ve gotten involved as a mentor with Big Brothers Big Sisters, which paired me with an amazing 10-year-old girl. We go on “dates” as she calls them, to all the best that the area has to offer, both in Newark and nearby towns (like the Paper Mill Playhouse in Millburn where we saw “A Christmas Carol,” and Turtle Back Zoo). I’m hoping to take her to the Newark Museum and the Dodge Poetry Festival later this year, and perhaps to see a game at the Prudential Center (where the Super Bowl Media Day was held). It’s good to have a home, and good to have a neighborhood. I’m grateful for small pleasures on a wintry day, like writing my blog with the cat on my lap and a cup of tea, watching late-afternoon strollers in the park and hearing the chatter of birds.